I saw the author at a business event called “Growth Summit“, where he was one of the main speakers. His session took all morning, so he was able to really drill down into his views on service culture. He spoke at length about the challenges of building a service culture at the Singapore airport, and how a proper service culture runs through the entire organization, not just the customer service department. Normally I don’t really enjoy ‘high-energy’ speakers that run around the stage and try to engage the audience, but this guy really spoke to me for some reason. It made total sense to me that a service oriented attitude will elevate the entire organization. It’s been a while since the event and since I’ve read the book, but I thought it could be helpful if you are thinking about improving your service culture. The book takes you step by step through the process that Mr. Kaufman has designed. It starts by a bit of soul searching WHY you want to change the culture, and how to take the LEAD from all levels of the organization. It describes how to do a proper inventory of your business processes to BUILD a proper service language and vision for the company. Finally it describes to have a predictably high service level it takes effort to LEARN what makes your organization work and to DRIVE a continuous search for ever increasing service level. The part that I always remember is what he calls the 6 levels of service. The video that I linked above is the first in a series, and he talks about the 6 levels of service in part 3, and it continues in part 4. Pay close attention to how service levels go down when you don’t work at keeping them up; what is unbelievable service today will be basic in the near future, as he explains in part 5. 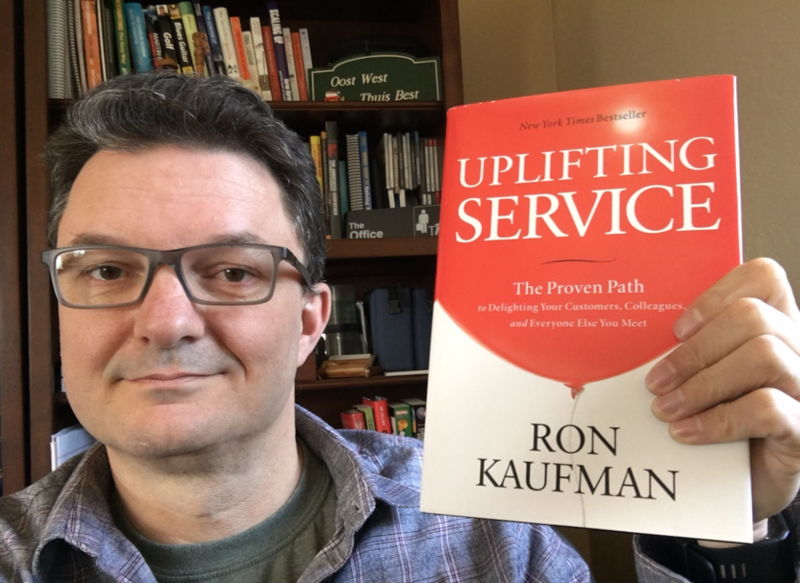 Uplifting Service is another one of those books that can really inspire you to take action, but to really make an impact, you really need to bring in a consultant to help you through the process. I made a similar comment on my review of Scaling Up. Maybe there’s a pattern with these books that I’ve picked up at the Growth Summit :). Service is a mindset, and it is a two way street. You give good service, you get good customers. Reading this book has helped me recognize organizations that do or don’t have it. Building a service culture takes a lot of effort, especially at a larger scale. This book may not have given me all the tools that I need, but it definitely helped me understand what it takes. WOW! Thanks for this amazing review. Really appreciate that you invested your time to read, enjoy, and benefit from this book. And thanks for inviting your readers to enjoy the YouTube videos. Good fun! All the best to you, and your readers.